I had a blast from the past yesterday that left me wondering…how much of our artistic future is seeded in our childhood toys? My mom got my daughter a Spirograph for Christmas. Remember those? You probably do. I even vaguely remember my mom saying that she had one as a kid. I remember the one I had as a kid had this little clip with spikes on it that you used to keep the ring from sliding all over the paper. No matter how cool your design was, you always ended up with these two holes punched into the paper…an ugly scar on your beautiful creation. You got an assortment of various sized rings, circles, and other various oddly shaped gears that could be rather difficult to trace around the ring. Sometimes the gear got stuck, or your pen slipped, and you ended up with an ugly imperfection in your design where the lines no longer lined up in perfect symmetry. You also got a couple of colored pens that dried up almost immediately, and it was always an ordeal to find another colored pen that fit into the tiny hole on the gear. Crayola markers were usually too big to fit, and who wanted to make an awesome drawing using only black or blue bic pens? Not this girl! Despite all it’s flaws, that toy was nothing less than awesome. 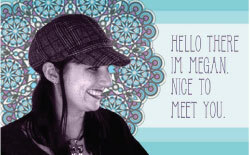 I would spend HOURS experimenting with the infinite combinations of shapes and patterns that could be created. I filled out page upon page with beautiful kaleidoscope like circles, each completely different from the next, just by altering my technique in some slight way. Fast forward to the present. I’m working at a painting at the kitchen table, and my daughter digs her Spirograph out of her arts and crafts cart. I’m immersed in my own work and don’t really pay much attention to what she’s doing, until I look up and see that she’s just tracing her pencil inside the stencils that came with the kit (they didn’t have that when I was a kid) and around the various sized circles. I don’t really think she understands how it’s supposed to be used. So I show her. She was AMAZED. Intrigued. SO PROUD that she can create something so intricate and complicated all on her own. She played with that toy for the next hour and a half. 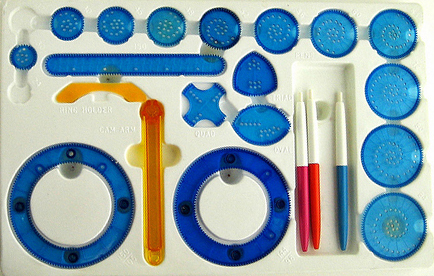 Until she got one, I had completely forgotten that Spirographs ever existed. Now that we have one in the house, I can’t help but think it might have had just a little influence in the artistic direction I embarked on. You be the judge.